Here’s one way to take a bite out of crime. In a move seemingly inspired by the Bond flick “Live and Let Die,” crocodiles may soon be used to guard death row inmates in Indonesia. News of plans for the island prison were reported by The Guardian, citing local media reports. The nation’s anti-drugs agency head, Budi Waseso, says there’s one key advantage to using the reptiles to guard drug dealers marked for death: The cold-blooded killers can’t be bribed. Waseso has also vowed to scour Indonesia for his crocodile guards himself. “We will place as many crocodiles as we can there. I will search for the most ferocious type of crocodile,” he said, according to the Guardian report. Indonesia has some of the toughest anti-narcotics laws in the world. The country regularly sentences participants in drug crimes to death. In April, the execution by firing squad of two Australian members of the so-called Bali Nine, Myuran Sukumaran and Andrew Chan, drew worldwide condemnation. The pair were convicted of being the ringleaders of a $3 million heroin smuggling operation. 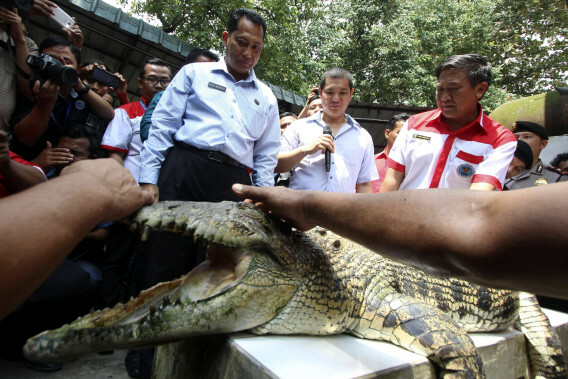 An Indonesian Narcotics Board official visits a crocodile farm in Medan, North Sumatra, on Nov. 11. JAKARTA — When Indonesia’s anti-drugs czar announced plans to guard a death-row prison island with crocodiles, the government rushed to explain that it was just a joke, but on Friday, Budi Waseso said he was now thinking of using tigers and piranhas too. 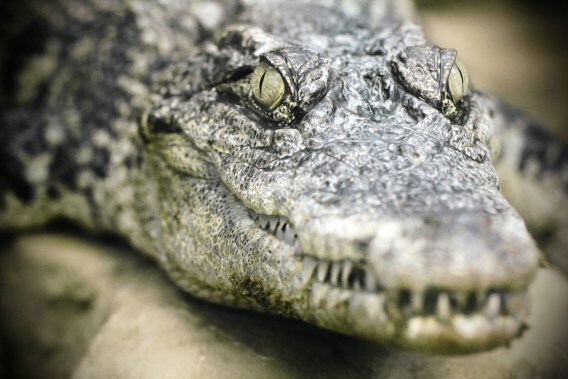 Media quoted the National Narcotics Agency chief as saying that he had already obtained two crocodiles from a farm to study their power and aggression and may ultimately put as many as 1,000 in place to keep convicts from escaping. Piranhas, meat-eating fish with sharp teeth and powerful jaws, are indigenous to South America and are not found in Indonesia. Waseso and officials at his office were not immediately available to comment on the reports. Indonesian President Joko Widodo declared a war on what he has dubbed a “narcotics emergency” after taking office a year ago, basing his campaign on a study that showed at least 40 people a day were dying from drug use. He has repeatedly refused clemency for traffickers and more than two dozen, mostly foreign, drug convicts have been executed this year after a five-year moratorium on the death penalty. In separate comments on the TVOne channel, Waseso rejected critics who said his plans to use animals as jailers were trampling on the human rights of convicts. Forest fires difficult to control? Call in the pachyderm patrol. Officials in Indonesia are using trained elephants outfitted with water pumps and hoses to help control fires that have claimed vast amounts of forest while sending thick haze into neighboring countries. For nearly three months, Riau province in East Sumatra has been blanketed by smoke from forest fires and land clearing, especially in peat-rich areas where flames are difficult to contain. Carrying water pumps and other equipment, elephants and their crews patrol burned areas in the national forest to ensure that fires don’t reappear after smoldering beneath the peat lands. 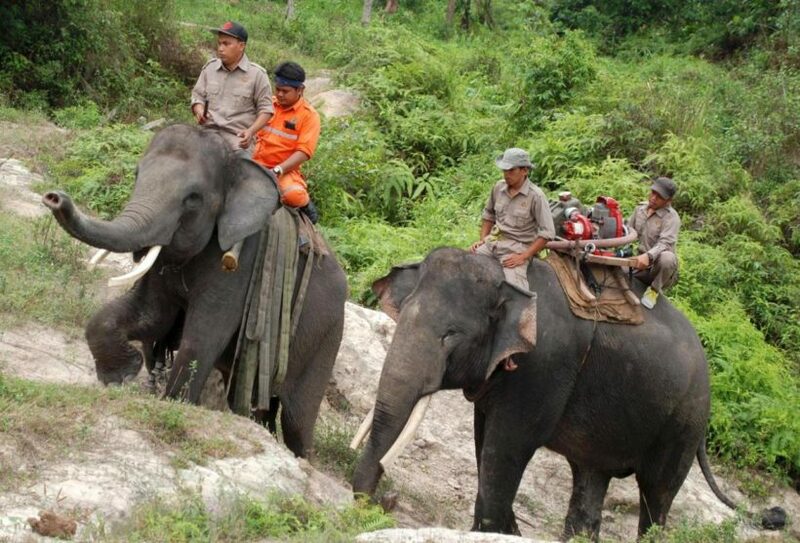 Supartono, the head of the Riau Forestry Division, who uses one name, said the elephants had earlier been trained to help patrol forests to find people encroaching illegally, as well as to resolve frequent conflicts between wild elephants and people by driving the wild elephants that enter human settlements back to their habitats. So far, Indonesia has been unable to put out the raging fires this year because of intentional burning and a rain shortage. Much of the forest land that was burned in the past 17 years was converted into oil palm and pulp plantations. Data from the Riau Forest Fire Prevention Taskforce show more than 10,000 hectares (25,000 acres) of forests and land have been burned in the province. Environment and Forestry Minister Siti Nurbaya says about 1.7 million hectares (4.2 million acres) of forests and plantation land have been razed by fires throughout Sumatra and Borneo. From The NY Post, Reuters and USNews.